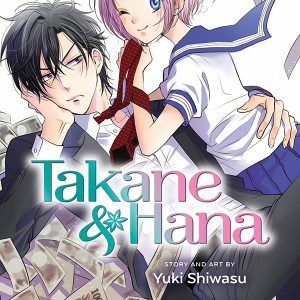 I received volume 1 of Takane & Hana from Viz for free to review here on my blog. Note: This review may contain spoilers for volume 1 of the manga. Length: 9 volumes (and ongoing) (in Japan) Viz will be releasing volumes bimonthly. Geeky: 2/5 – No action, but a good dose of comedy could make this one appeal to geeks of any gender. Sweetie: 5/5 – Here we have a love story / slice of life manga with some rather unconventional characters. I enjoy the humor and unique characters. This is not a cookie cutter shoujo manga. Story: 9/10 – Takane and Hana meet via an arranged marriage; however, it is not Hana who is supposed to go to the meeting. Hana has an older sister, Yukari, who was selected by the chairman to meet his grandson, Takane. Takane is heir to a successful wealthy conglomerate, where Hana and Yukari’s father happens to work. Yukari refuses to go to the arranged marriage, forcing Hana to have to pretend to be her older sister. Takane can see through their deception right away, which causes him to be more frank and open around Hana. Takane is used to getting anything he wants, so when Hana storms out of their arranged marriage meeting, he takes an interest in her. He begins to show up at her school with luxurious gifts, wearing expensive clothes, and driving a fancy foreign car. Eventually Yukari tells Hana that she has changed her mind and wants to meet with Takane. The three agree to meet to explain the situation, but Hana runs away during their meeting. Takane pursues Hana and calls her by her real name for the first time, showing that he knew all along who she really was. Hana steals a kiss from Takane which again shakes up his usual routine. The two continue to meet, usually going to expensive fancy restaurants. But one of my favorite parts of the manga is when Hana plans their date; she wants to do all commoner activities. Hana plans a day full of karaoke, bowling, fast food, and a scary movie. However, at the first stop of their date, Takane gets called into work. Hana continues to do their date alone by herself, until finally Takane meets back up by sneaking into the movie. He falls asleep exhausted from work. He also worked all night the night before so he could take the day off. Hana learns and sees many different sides of Takane that day, and begins to understand that he really isn’t such a bad guy. There is a 10 year age gap between the characters though, so their relationship must still remain a secret, because Takane is expected to marry a suitable woman to help him with his career. Takane continues to go to arranged marriage meetings, but rejects his suitors and continues to see Hana. Hana worries that she is not good enough for Takane, but he tells her he will be the one to decide if she is good enough or not. My only complaint with the story is it has some pacing issues. There were parts of the story where I would stop and see if I missed a page. It seemed to jump around a lot in the first 2 or 3 chapters, and then became more well fleshed out and evens out in the next chapters. Characters: 8/10 Hana is a typical high school girl, carefree, spunky, athletic, happy go lucky, friendly, and outgoing. Takane is a well groomed businessman and heir to a large fortune. Takane is used to always getting his way and is used to enjoying the finer things in life. However, both of our characters are bored of their routine lives. When they meet, their routine is shaken up. Takane is very rude, and he loves to be the center of attention. He loves to “look down” on the world / other people. However, he is not without his good points either. He is sincere/honest about his feelings (at least when he is around Hana – around other people Takane is forced to behave politely due to the responsibilities of his family and business.) Takane is a very hard worker, but he also tries to make time for Hana. Takane is not good at expressing thanks/gratitude, or admitting that he is enjoying his time with Hana. However, Hana learns certain things about Takane. Like when he is truly happy, his smile is different, more like a smirk. His full / peaceful / contented smile is only a fake smile put on out of politeness. Hana realizes Takane only really smiles honestly around her. Hana is also not honest about her feelings for Takane. She decides to treat their relationship like a game. Both of our characters are competitive and love to tease each other, and neither of them want to lose this “Game”. I really love these characters, but I did deduct a few points because all of the minor characters are far less developed. This is only the first volume though, so I expect this to improve. It’s also worth pointing out that many readers may be uncomfortable with the age gap in this manga. In Japan though this age gap is very common. Even in other shoujo manga, such as Sailor Moon, Mamoru was a college student and Usagi was only 14. While age gaps like this may seem odd to American readers, it is important to understand these cultural differences. Artwork: 10/10 The artwork is cute, and it makes me smile/laugh. I love Takane’s smirk. Hana is cute. Takane would maybe be handsome, but his facial expressions are usually very smug/conceited. The background and coloring techniques are also cute. The art and character designs are also very consistent throughout the first volume.